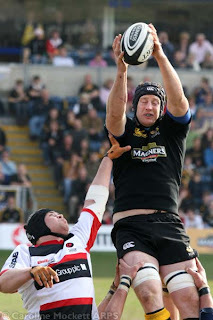 For some time, I've been meaning to give my rugby photography site a bit of a fresh coat of paint. Plus, the way the site was put together was a little archaic, so I've taken the opportunity to do it the right way, adhering to Web Standards, which should make it faster to load, easier to use and generally more accessible to a wider range of readers. It should also work nicely on your mobile phone, if you have internets on it! On other notes, I see Danny Grewcock has lost his appeal against the six week ban he received for punching during the ECC Final. 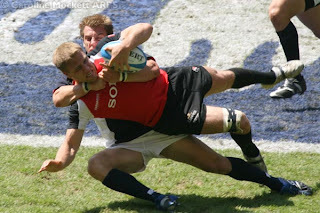 This rules him out of all the England RWC warmup games, and the first few fixtures of the tournament. Brian Ashton has said he can't name a banned player in his 30-man squad, so Grewcock really has let another moment of madness ruin his chances at a last World Cup place for him. I'm also pleased with the new format for the Anglo-Welsh Cup. To be honest, I was getting a bit sick of Saracens always having to play Wasps and London Irish in their group, seeing as we meet them regularly in the Premiership. So it will make a great change to be able to see Leeds, Bristol and Llanelli Scarlets this time round. The last post covered the end of the season matches, and I decided to go to the ECC Final, Bath Rugby against ASM Clermont-Auvergne at the Twickenham Stoop. See more photos of the team and fans celebrating. It seems that Danny Grewcock couldn't keep his temper in check during the game, and now faces a six week ban for striking an opponent. This rules him out of the World Cup warm-up matches on 4th and 11th August, and the start of the actual World Cup campaign, so I can't really see him figuring very highly in Brian Ashton's plans for the tournament. The first game with a morning kickoff, was the Bowl Final, seeing Canada take on the USA. Canada were very much in the driving seat, and ran away with the game, winning 52-10! Nothing much I saw worries me about England meeting the USA in the first RWC pool match in September, I'm afraid! 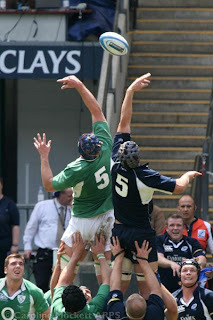 Next up was the Plate Final, contested by Ireland A vs Scotland A. This was a very entertaining game, much closer than the try-fest of the first one, with the Irish eventually triumphing by a measly point, 22-21. Another entertaining game, again close, but the Saxons managed to retain the upper hand and won 17-13. Good going, lads! So, that's about it for the summer. I'm happy to say I have a ticket for the England vs France World Cup warmup game on 11th August, and will be back at Twickenham a week later for the more traditional start of season Middlesex Sevens Tournamet. I might find a few things to post in the meantime, but don't be surprised if it all goes a bit quiet for a few weeks! It seems ages since I've done a blog, so this will have to be a roundup of the last few weeks. 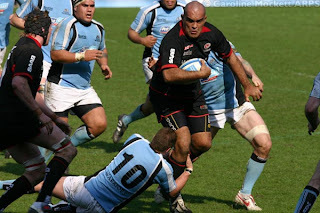 Sarries won 23-19 to take them trough to the ECC Semi-Final. 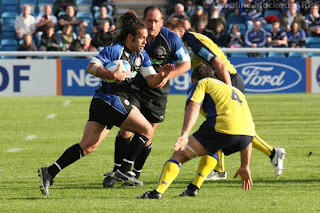 The next match was away at the Adams Park stadium in High Wycombe, for a Guinness Premiership match against Wasps. The next week, it was back at Vicarage Road for another Guinness Premiership game. Sarries were on good form again, and won 33-19, putting them in a good position going into the final games of the season. It was a tough game, and Sarries just missed out, going down 30-31, and putting Bath through to the final with Cleremont-Auvergne. 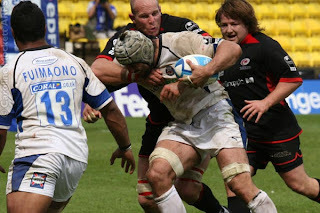 Despite that disappointment, Sarries season ended on a high in 4th place of the Guiness Premiership, and putting them back into the Heineken Cup for next season - now the wrangling between the various factions has been ironed out!